This entry was posted on Sunday, October 21, 2012 at 12:33 am	and is filed under Environmentalism, Travel. Tagged: environment, Japan, nature, Oita. You can follow any responses to this entry through the RSS 2.0 feed. You can leave a response, or trackback from your own site. 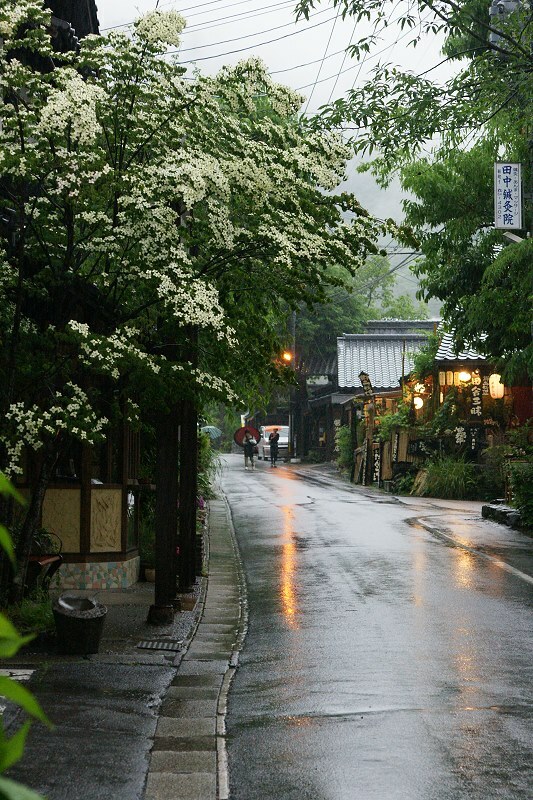 Lovely photo of what I assume is the main street in Yufuin. Couldn’t remember where Oita is so looked it up on google maps. NE coast of Kyushu. Interesting location. Nor am I sure of the distances in Kyushu so I did a google travel map from Oita City to Fukuoka (the largest city in Kyushu). When I first specified the map it routes you by train through Kitakyushu to the north and takes 2 hr and 45 mins. Interesting that the default means of transportation google gives you is train – although not at all surprising. I think it’s possible to take a train directly from Fukuoka without going through Kitakyushu, or at least was. They had a special service with green cars. I took it the second time I went (about 10 years ago). That time we went to a place up in the mountains, had a terrific trad Japanese lunch in a trad Japanese room, and took an outdoor bath with a view across a valley to mountains in the near distance. It was a somewhat misty day this time of year. The main street looks less pastoral closer to the train station, but gradually filters out the farther away you get. This might not be the main street, but it’s not a big place.